The final GDP growth number issued by the Chinese Communist Party after its recent National Congress was, of course, inch-perfect and tailored to expectations. The Chinese economy grew 6.8 percent in the third quarter, providing a nice backdrop for the congress in October. Now that the congress is over, however, and Xi Jinping has strengthened his grip on power, the regime is getting serious about reform, which is unsettling for financial markets. 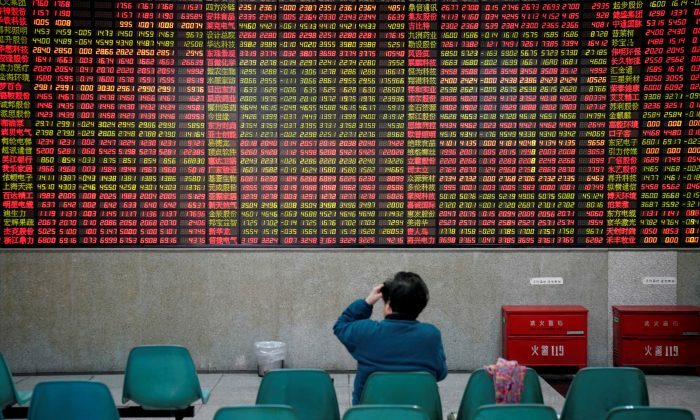 The Shanghai Composite stock index lost 3.2 percent in a matter of days as a host of regulations were announced on Nov. 17 by the newly created Financial Stability and Development Committee, a super regulator under the direct supervision of the State Council, China’s cabinet. It aims to reduce the amount of money so-called shadow banks can pump into the economy without supervision and control by central authorities. “Even Chinese officials are acknowledging the problem and taking steps to address it—a notable change considering that the government is reluctant to admit any weakness in the Chinese economy,” the research firm Geopolitical Futures wrote in a note to clients. These shadow banking assets are worth around $7.58 trillion, depending on who is counting. The money fueled the recovery in the Chinese economy, after a slowdown in 2016, by channeling credit into the booming real estate sector, while regular banks hit their lending limit. And despite the fact they only make up roughly one-fifth of the Chinese banking system, a disorderly unwind of these assets would cause havoc, according to Victor Shih, an associate professor at the University of California–San Diego. “Despite the modest size of shadow financing relative to the banking sector, at 50 trillion [yuan], a panicky unwinding of assets in the shadow banking world can spell serious problems for China,” he wrote in a report for the Mercator Institute for China Studies. The challenge, however, is that limiting the funds available to the real estate industry can also lead to a crisis. China’s difficult task, then, is to decrease the amount of offbalance- sheet debt while preventing a downturn in real estate that could threaten the economy. Although shadow banking flows have still been growing as of the National Congress, the real estate market has already started to cool down as a result of regulations launched throughout 2017 that specifically target property ownership. Up 17 percent over the year in the first quarter, sales of residential floor space actually fell 2 percent in the third quarter. “New restrictions on the resale of property and fading support from shantytown redevelopment will keep weighing on housing sales. This spells further downside for residential investment growth,” wrote research firm TS Lombard, in a report. Shadow banking credit is mostly made up of real estate loans, either in the form of mortgages or loans to developers. If these loans go bad because the market is turning south, it will ripple through the lending system, eventually reaching other parts of the economy, just like U.S. subprime loans did in 2008. If new funding to roll over bad loans—a common practice in China—is cut off because of regulation, it will be a double whammy. Thus, while it was all smooth sailing before the National Congress, the two sets of real estate and asset management regulations are rattling the markets now, especially because Xi has always talked about reducing money and credit in the economy but never acted. Communist Party mouthpiece People’s Daily published a few op-eds through 2016 that indicated the regime is serious about reform. “Reform was decided on after careful deliberation about China’s economic situation,” the newspaper quoted an authoritative but unnamed insider as saying, who is widely believed to be Xi himself. A slowing economy and stresses in the foreign exchange markets in 2016 forced the regime’s hand, though, and it had to pump up another property bubble to ensure smooth sailing for the political conclave in October. Now that Xi’s power is stronger, the quick announcements of reforms make it look like he won’t waste more time in tackling the debt problem. And the markets are taking him seriously, as it’s not just the stock market that has sold off. Real estate is already taking a hit, and now everything from corporate to government bonds, as well as the strong Chinese currency, is jittery. It’s the beginning of 2016 all over again, except that global markets do not seem to mind the clouds in the Chinese sky. The U.S. dollar has been falling for most of 2017, but spiked almost 4 percent against the yuan leading up to the congress. In August 2015, a surprise move of the same magnitude, dubbed the “mini devaluation,” sent global markets into a tailspin for the rest of the year until the beginning of 2016. Chinese corporate bonds have also been selling off for more than a year now, with the yield on the top-rated bonds rising from around 3 percent to 5.3 percent over the last 12 months. November alone saw a spike in yields of 0.33 percent, according to a report by Bloomberg. Many observers have been waiting for the enormous Chinese corporate debt bubble, which makes up 165 percent of GDP, to burst. But, similar to Japan’s government debt bubble, that has never happened. And even though China’s government debt only makes up 48 percent of GDP—far less than the U.S. ratio of 106 percent—government bonds have also sold off sharply with yields on the five-year note reaching 4 percent, the highest in years. While the deleveraging cycle may start with shadow banking credit—the tip of the iceberg—it is government that will ultimately end up with the bad debts if the Chinese regime wants to avoid a crisis similar to that which took place in the United States in 2008. Central governments and central banks took on a lot of the bad debt from private banks and shadow banks, and this will likely happen in China, too, boosting the government debt-to-GDP ratio to well above 100 percent. So traders are selling government bonds on the expectation of new supply coming onto the market, as well as the fact that some investors have to sell liquid securities to cover shortfalls in illiquid investments, like shadow banking products. “Analysts of past bubbles also underestimate the extent to which the ruling Chinese Communist Party controls nearly every aspect of the financial system through party committees in every financial institution in China. This control decreases the chance of panic selling, often the trigger of a crisis,” wrote Shih. So despite that the regime seems to be serious about reform this time around, and the first cracks in the markets are appearing, the China crisis may never show up. The pattern would be similar to Japan’s correction in the early 1990s. The country will, however, have to live with GDP growth lower than 6 percent in the future.